One of Minnesota’s first generation of female artists. Elsa Baubach Jemne is notable as one of Minnesota’s artistic women pioneers of the early twentieth century who studied at fine art academies, both in the United States and Europe, and had successful professional careers in the arts as working artists. They played significant roles in the development of art schools, galleries and art organizations in Minnesota. One of seven children, Elsa was born on July 7, 1888, in St. Paul to Mr. and Mrs. Albert Laubach. Due to an unfortunate turn of events in her father’s business, the responsibility for funding any post-high school education fell on Elsa; so, she went to work for several years as a commercial artist at Brown & Bigelow, an advertising firm in St. Paul. This was not the type of artist she wanted to be. Unsatisfied as a commercial artist, Elsa enrolled at the St. Paul School of Art, attending classes in the evenings or as her work schedule allowed. Elsa did well in her classes and won a bronze medal for drawing. She also took classes in murals. Longing to move somewhere so she could do “real” work which could change the world, in 1912, Elsa moved to Philadelphia to study at the Pennsylvania Academy of the Fine Arts even though leaving her mother was difficult for her. She went to work at the Philadelphia Record and Gimbel’s Store, where she found herself doing fashion drawings, which she did not enjoy but it paid the bills. Elsa’s most influential teacher at the Pennsylvania Academy was Violet Oakley, who was a prominent mural artist. In 1914, Elsa received a fellowship for study and travel in Europe. She spent most of her time studying in Italy, doing frescoes and sculptures. Meanwhile, World War I broke out, so she returned to St. Paul for her third year of education. She did later return to Europe, after the war, for further study. After graduating, her career took off, and she was commissioned to do several murals in Pennsylvania and New York. She intended to return to the Eastern U.S.; however, she married Magnus Jemne, whom she met while staying at a St. Paul boarding house. Magnus was an architect by training and worked with Cass Gilbert, whose firm designed many homes, churches, and public buildings in the Twin Cities, including the State Capitol. Elsa and Magnus raised two daughters. Elsa was determined to continue her career. Murals were a major part of her work. Elsa’s murals can be found at the post offices in Hutchinson and Ely, Minnesota, and Ladysmith and Lake Geneva, Wisconsin; the Stearns County Courthouse, St. Cloud, Minnesota; the Minneapolis Armory; Central High School, Minneapolis; St. Paul’s Women’s City Club; and the historic Brandon Auditorium in Brandon, Minnesota (as well as other places around the country). Elsa was commissioned by the Great Northern Railroad to paint portraits of Blackfoot Indians such as Little Plume; Many Tail Feathers; Mrs. Curly Bear; and Lazy Boy. She lived amidst their lodges in a large teepee. Native Americans are also portrayed in the Brandon and St. Cloud murals. She apparently felt it important to depict the culture of each community that had commissioned her to create art work for them. Elsa taught at the Minneapolis School of Art from 1946 to 1950. At that point in her life, she began focusing on easel painting and works on paper, which she exhibited regularly at the Minneapolis Institute of Art, the Walker Art Center, the Minnesota State Fair, and other venues in the Twin Cities. Jemne suffered a serious stroke in 1962, after which she was not able to work much at her art work. Both of the Jemnes’ daughters also became artists. Elsa Jemne was very dedicated to her work and her family; and she was able to juggle the demands of both. She was admired for her ability and productivity in many art mediums and was an inspiration for many women pursuing careers outside the home. Elsa died in 1974 at the age of 86. Elsa’s grandson, Adam Granger, has graciously provided the Brandon History Center with a portion of her diary entries while she was working on the Brandon project. 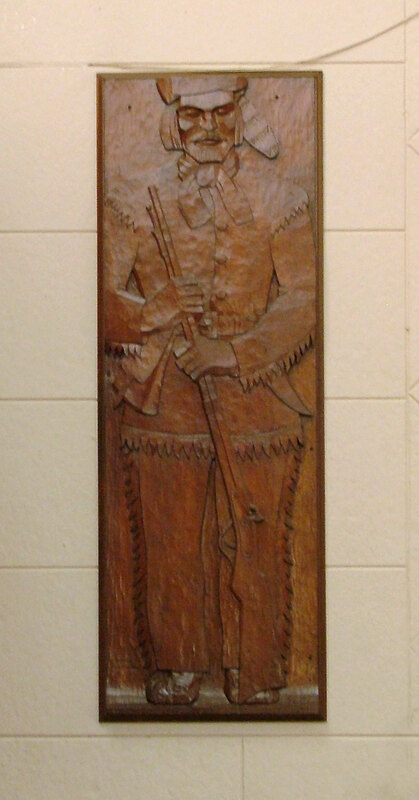 It appears that she also may have done the art work for the two carved side panels (the Native American and trapper) that hang on either side of the stage. Her notes indicate that she also worked on designs for light fixtures for the “Brandon Community House”, her term for the auditorium. According to Elsa’s diary entries, she began her Brandon art work in December of 1935 and finished it sometime during the summer or fall of 1936. Elsa commented on her “struggling over the stagecoach wheels.” Her diary entries can be found at the History Center and make very interesting reading. Much more could be said about Elsa Laubach Jemne, but her art seems to say it all. We feel very fortunate to have one of her murals in Brandon. Additionally, her work can be found in various public buildings around the state of Minnesota and beyond. She is recognized for her oil paintings and large-scale murals. Information for this article was gleaned from Pioneer Modernists: Minnesota’s First Generation of Women Artists authored by Julie L’Enfant, Afton Press, Afton, Minnesota and Elsa’s diary entries provided by her grandson, Adam Granger. Artists and their works are a vital part of our history. Art depicts life during an era of history and can be appreciated forever. We hope you can stop by and visit the Brandon Auditorium when you are in the vicinity. We think it’s an often overlooked gemstone here in the lakes region, and a unique opportunity to see original art by Elsa Laubach Jemne. Special thanks to Hilda Bettermann and the Brandon History Center for making this blog post possible. The Brandon History Center and Auditorium is located in downtown Brandon, Minnesota which is just off of Interstate 94 between Alexandria and Fergus Falls, Minnesota.